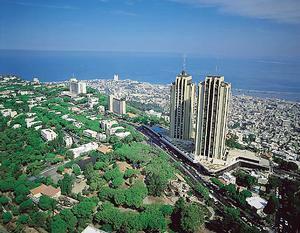 The Dan Panorama, Contemporary in style and young in spirit, the Dan Panorama rises twenty-one stories above mount Carmel, offering thrilling views of Haifa bay and miles of coastline. 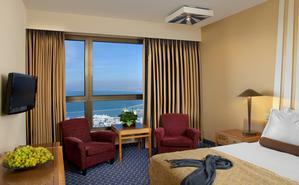 Point Ideally located for business travelers, the hotel is directly linked to Haifa's upscale Panorama mall. Step out of the hotel lobby and you have elegant stores and fine marchandise to view. Close by are the outdoor cafes and stores of the lively Carmel center - A favorite gathering for locals and visitors.The hotel's convenient location makes sightseeing easy and fun with myriad of things to do and see in Haifa - and the Galilee and Arab villages close by, all you have to do is go along pathways. 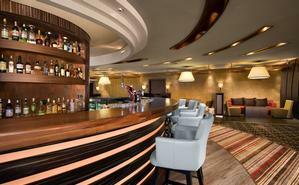 Free Wi-fi in all guestrooms and public areas. Guests can enjoy a children's club and a seasonal swimming pool. Overlooking Haifa Bay on slopes of Mount Carmel. "Outstanding view, good accomodation, fair price..."